Sometimes you might don't have access to wireless internet at office or somewhere but you have cabled internet and you need to access internet from your mobile phone, then this solution will help you. You can easily share the Wired internet into Wireless network mode by using this software. This software act as a Virtual Wireless Router and use your laptop or pc wireless card to share the broadband internet wirelessly. 1. Download Virtual Router from here . 2. 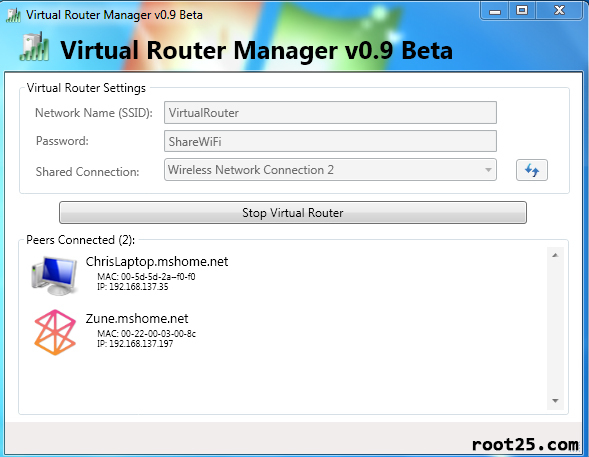 Install VirtualRouter on your Windows 7/Vista or XP. 3. Run the software from start menu. 4. In Network Name(SSID) field put a name for your WiFi network. ex "My_Hotspot"
5. In Password field , determine a password for your WiFi, it should be at least 8 characters. 6. Choose your wired internet source at Shared Connection section. 7. Click Start Virtual Router. 8. Now from your mobile,tablet or laptop search for wireless networks, you will find your network, in my case "My_Hotspot" then click connect. you will be asked for password, enter the chosen password in the virtual router. 1.Be sure the ip configuration for your mobile,tablet or laptop that want to connect internet via wifi set to DHCP and don't use manual IP configuration. 2.Be sure that your Antivirus/Firewall is not stopping the software from sharing the internet. MOST OF TIME THIS IS THE PROBLEM! So you need to declare a new rule for your firewall to let this software work freely or disable the firewall. Try to disable the firewall or antivirus for a short while to see if its working or not? But your case sounds strange , how might viber & whatapps works but the browser don't!